PAYPAL: Paypal is currently ebays preferred method of stealing high value electrical items off sellers. There are a number of various ways you can use to steal this laptop using paypal. 1: A Fake “Item Not Received” (I.N.R) Claim – All you simply have to do here is purchase my item using an unverified paypal account. Then when you receive the laptop, simply claim that you didn’t receive it at your registered (credit card) and paypal will give you all your money back ! 2: A Fake “Item Significantly Not As Described” (S.N.A.D) This is a great way to steal items off sellers. Simply start a dispute after you get the laptop making up some lie about the item being damaged etc – You could use Photoshop to make up fake pictures of damage. Paypal will ask you to send the item back to me, but don’t bother – they never enforce that on buyers and after a short wait you will get all your money back and you will still have the laptop. 3: A fake “Unauthorised Use” Claim – This is a super way of stealing items on ebay and is widely used. Simply claim that someone hijacked your account (paypal & ebay) and that you didn’t order the laptop. Then in conjunction with a fake I.N.R claim you can simply steal the laptop and of course, get your money back. 4: A Stolen Credit card – Of course, ebay make no real attempt to vet any of its buyers, so hey, just register a new ebay account using fake ID information and link it to a paypal account set up with a stolen credit card – and hey presto – A free laptop. Although officially banned on ebay, fake western union payments are the preferred way for Nigerian Scammers to steal high value electrical items. Simply email me (using pigeon English) telling me that you would like to buy this item using Western Union – Tell me that you would be happy to pay over the odds for the laptop and that it is a present for your mother in law. Then send me a fake western union payment notification and I send you the laptop – Perfect. This method of stealing items off sellers is very widely used on ebay and of course, as ebay do not properly verify buyers its easy to do. Make sure you use Pigeon English as I am really really stupid and it’s bound to fool me. If you are a traditionalist like me you may prefer a good old mugging. Simply offer to meet me on some dodgy housing estate somewhere and have a load of you mates hiding behind a hedge with a few iron bars. Again, offer to pay me over the odds as there is nothing better than using a sellers greed to bait them into a scam. I would be grateful if you could avoid killing me as this will cause bad publicity for ebay which would be terrible. In the unlikely event that you are actually a genuine buyer then you really should be shopping in a real shop and not this scammers paradise. 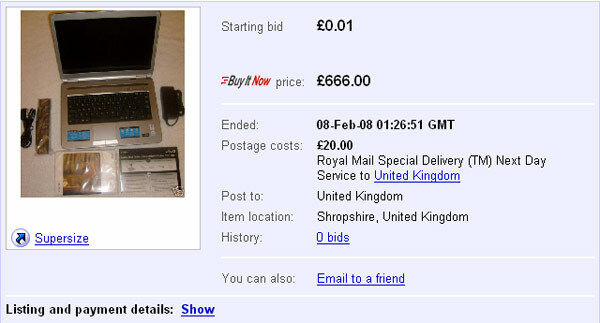 However this laptop does really exist and is really for sale. You can email me or skype me with suggestions on how we may actually transact this item to both our satisfaction – with both our safety in mind. Don’t even think of buying it using paypal. I’ve only listed it as accepted because ebay run a protection racket that means I have to accept it. If you do pay by paypal I will simply refund your payment and give you a nice new shiny NEG. Of course you will no doubt be aware that from May onwards you will be able to blackmail sellers into giving you free P&P / discounts etc. You will be able to give them neg feedback and they will not be able to give you any.. I regret to advise you that because this rule does not come in until May this option of scamming me is not open to you yet. 1: Ebay will see this listing and will hopefully close my account, saving me a 180 days wait to do it myself. 2: You will save me listing fees, making this a free advert. **** STOP PRESS **** PEOPLE THERE IS NO POINT BIDDING ON THIS ITEM. IT WILL SURELY BE REMOVED VERY SOON BY EBAY. YOU CAN FIND THE EXACT SAME ITEM AND MY DETAILS ON TAZBAR (GOOGLE IT). ANYWAY, IM OFF OUT NOW, IF THIS IS GONE BY THE TIME I GET BACK – HOPE YOU ALL ENJOYED IT AND EBAY, THERE IS A SERIOUS SIDE TO THIS. SOONER OR LATER THE TRICKLE OF THOSE OF US LEAVING WILL TURN INTO A FLOOD. READ THE LETTER YOUR FOUNDER WROTE AND THEN TRY AND FOLLOW AT LEAST SOME OF IT! What eBay founder's letter is that, we hear you cry? It's this one, and it'll bring a tear to the eye, make no mistake. Oh yes, in response to those of you who were wondering, the Sony had attracted no bids when the auction closed.